Choose a Side and Use the Force to Win this Galaxy-Spanning War! Return to the far away galaxy in the second crossover between Angry Birds and Star Wars. Last time, you followed the journey of Red Skywalker as he grew from a young padawan into a Jedi master and destroyed the Empire once and for all with his friends. 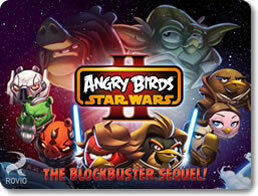 With Angry Birds: Star Wars II, you will journey back to the years before this historic event. Follow the story of the prequel trilogy to see how young Anakin Skywalker fell to the Dark Side while the Empire took over one launched bird at a time. It will be a tale told from two sides: the heroic birds and Republic forces of the Light Side, and the Bad Piggies ruled by their Sith lord on the Dark Side. Either way, expect a whole lot of Force-pushing slingshot action as war breaks out across the galaxy! Everything you love about Angry Birds is back in full force. 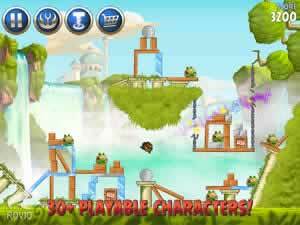 Load your feathered friends into the slingshot and bombard the pigs with everything you have. Destroy every on-screen enemy before you run out of ammo. Use physics to your advantage to topple enemy structures and kill your enemies more efficiently. Different materials react to force in different ways. Wood falls over easily, glass shatters on impact, metal is harder to push, and so on. Use the levels to your advantage. Cause even more destruction by launching catapults, unleashing electromagnets, and more. Be wary of gravitational pull and inertia in the outer space levels. Earn more points and stars by launching as few birds as possible. Find hidden maps and treasures to unlock bonus levels. When you play on the Light Side, you’ll take control of the heroic forces of the Republic with their stalwart Jedi warriors. Fend off the armies of pig droids as you fight to free Naboo. Slice up obstacles and piggies alike using Qui-Gon Jinn and his lightsaber. Use the Force to push objects away in midair with Bomb as a young Obi Wan Kenobi. Bounce Yoda off of the walls to cause all sorts of untold destruction. Swing Jar-Jar Binks from overhanging platforms with his prehensile tongue and watch him crash into things. If you have a taste for the Dark Side, then you can play from the Piggies’ perspective for the first time in the Angry Birds saga. Command the soon-to-be Imperial forces, unleash the power of the Sith, bring down the Republic, and help Palpatine take over the galaxy! 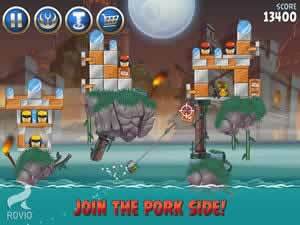 Launch an explosive missile using the pig Shocktroopers. Fry those feathered fiends with Darth Sidious and his Force Lighting attack. Slash Naboo and Republic soldiers to pieces using Darth Maul’s double lightsaber. Once again, Angry Birds and Star Wars make the perfect crossover. With artillery units based off of all your favorite characters from both the original and prequel trilogy, fans of the Star Wars universe should be in for a treat here. Meanwhile, all you veterans of Angry Birds can enjoy an all new flock with completely different ways to blow stuff up from one arm of the galaxy to the other. Join a side in the conflict and unleash the Force like it’s never been unleashed before!